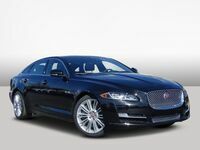 Possessing luxurious styling, robust engine options, nimble handling, spacious and sophisticated interior and an abundance of standard features, the 2016 Jaguar XJ in San Antonio TX is the pinnacle of the Jaguar sport sedans. Projecting distinction, exclusivity and English refinement, the new XJ features quality of craftsmanship that sets it apart from its luxury sedan competitors. 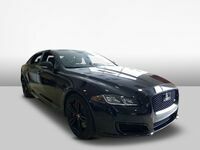 If you live in the Boerne, Schertz, New Braunfels or anywhere else in the San Antonio area, you'll be pleased to know we offer the spectacular Jaguar XJ right here at Barrett Jaguar. The 2016 XJ makes a powerful statement with its beautiful exterior design. With its fusion of honed dynamic lines and sculpted elegance, the XJ fulfills the key Jaguar brand aesthetics of beauty, purity and simplicity. The front of the car is more bold and assertive than ever with an imposing new front grille design, which is framed by more powerful and efficient full LED headlamps, boasting a striking illuminated ‘double J’ daytime signature light design. The rear screen wraps seamlessly around the XJ to create a floating roofline that emphasizes the long, low and wide profile. The cabin in the XJ is both sporty and luxurious, designed to excite the senses and provide a welcoming experience. The impression of space in the XJ is accentuated by the panoramic roof and the sweep of hand-crafted veneer that runs around the cabin, while twin needle stitching adds to the lush feel of quality and provides enhanced durability. You and your passengers can always be connected and entertained with the superb multimedia in the XJ. The InControl Touch Pro seamlessly integrates with your smartphone to offer a range of services that enhance the driving experience, while the highly intuitive multi-touch interface can be personalized and uses familiar smartphone and tablet gestures– just tap, pinch or swipe for fast, accurate access to information. The XJ offers a range of advanced safety and driver assistance systems that are designed to protect you and your passengers on every journey. For effortless long distance driving, Adaptive Cruise Control is designed to maintain a pre-set gap between you and the vehicle in front, while Traffic Sign Recognition scans the road ahead for traffic signs and alerts you on the instrument cluster. With exceptional engines, a lightning fast transmission and advanced driving technologies, the Jaguar XJ is a thrilling car to drive. The 3.0L V6 340 hp Supercharged engine provides high performance with an immediate response even at low engine speeds. 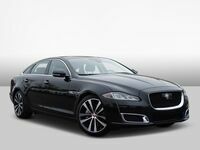 With 332 lb-ft of torque, it can accelerate the XJ from rest to 60 mph in as fast as 5.7 seconds. For even more power, the 5.0L V8 470 hp Supercharged engine provides exceptional levels of power at all engine speeds, outstanding mid-range acceleration and 0-60 mph acceleration of just 4.9 seconds. Driving pleasure on the new XJ is further maximized by its strong yet light aluminum monocoque construction, all-surface progress control, adaptive driving dynamics and available all-wheel-drive system. With beautiful styling, outstanding performance, superb tech and safety features and a comfortable and luxurious interior, there is much to like about the new XJ. If you’d like to get behind the wheel of the this spectacular sport sedan, then we encourage you to get in touch with us at Barrett Jaguar. We look forward to showing you the impressive capabilities and fantastic features of the 2016 Jaguar XJ. 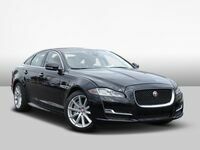 Interested in a 2016 Jaguar XJ?